Mercedes driver Nico Rosberg won in Monaco in 2013. He said: "For sure the opposition is going to be closer in Monaco. I expect Red Bull to be a lot closer. "But we have a strong package, engine and car, so we should be fine." Vettel, speaking after this week's Barcelona test, said he felt much more comfortable in his car on his way to fourth place in the Spanish Grand Prix on Sunday after a difficult start to the season. The German had struggled in the previous two races in Bahrain and China, in both of which he was out-paced by team-mate Daniel Ricciardo. Vettel had a troubled weekend in Spain, with reliability problems leaving him short of track time and 15th on the grid, but he fought back through the field impressively in the race to finish one place behind Ricciardo, who qualified third. "Sunday was already a step in the right direction," Vettel said. "Obviously, last weekend was a very short weekend from my side with few laps but it was definitely a much better feeling in the car than previous races." His struggles in the early part of the season were caused by the Red Bull not behaving the way he wanted following this year's rule changes. Over the last three years Vettel adopted a unique driving style to extract the best from Red Bull's exploitation of exhaust-influenced rear aerodynamics, which the team managed better than any rival. Vettel would destabilise the rear of the car on corner entry, so it was pointed quickly towards the exit, and then stabilise the resultant slide by getting on the throttle, which forced exhaust gas to flow over the aerodynamic parts at the back of the car and create downforce and grip. But 'exhaust-blowing' is not possible this year because the exhaust pipe position has changed. For this season Vettel had been trying to drive the car in his previous style, but because it lacked the grip to make it work he was slower and had higher tyre wear than the smoother Ricciardo because the car was sliding too much. 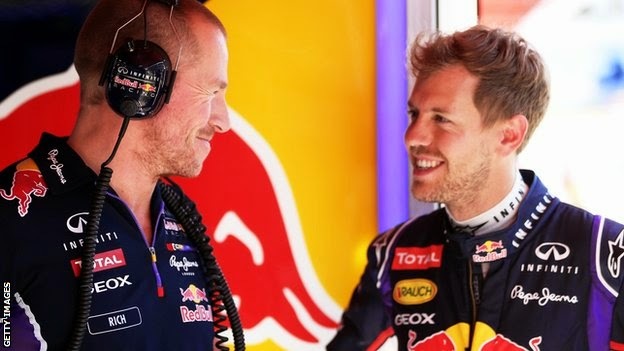 Red Bull say Vettel had not changed his driving style in the first four races because he knew that if the team could make the car work the way he wanted he could gain a lot of lap time. But before the Spanish race he was persuaded that the team would not be able to make the car behave like it had in 2013 and that he had to change his driving accordingly. Horner said: "Sebastian is very demanding of what he wants in the car and he creates lap time in a very specific way. "With the immaturity of these engines we have not been able to replicate that for him and it's about meeting in the middle." Another problem was that Vettel's driving style relies on him being able to accurately predict the grip levels and behaviour of the outside rear tyre in cornering. But that was difficult because the Renault engine's torque delivery and energy recovery systems were still "crude", according to Horner. The energy-recovery and torque delivery affect the physical behaviour of the car on corner entry and exit. Renault head of track operations Remi Taffin said this aspect of the engine was improved ahead of the Spanish GP. "The main issue Vettel has with the Renault power unit is driveability," Taffin said. "He is very sensitive to the torque delivery. We had a lot to do in this area and I think now we are in a position which Sebastian is happy with and he can start on working with the car. "If Sebastian is happy with the driveability it can be a question of tenths [of a second per lap]. So it could be three, four, five tenths. If he is very happy with the car and he can nurse the tyre, at the end of the race it is seconds."